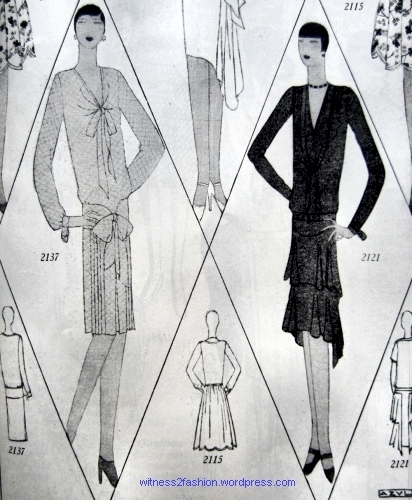 Afternoon and daytime fashions for July 1928. Butterick patterns featured in Delineator magazine. 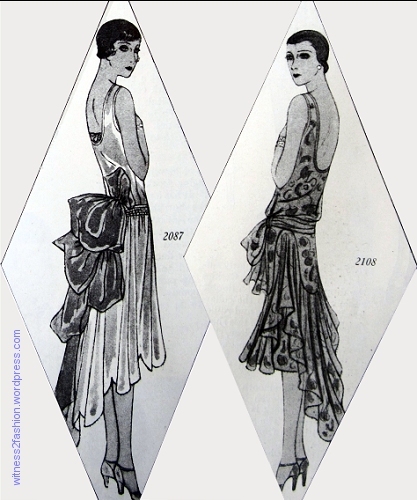 As I mentioned in Part 1 of this “Hems Going Up/ Hems Going Down” series, even in the years when 1920’s hems were at their shortest, there were options for longer variations, especially in more formal afternoon and evening dresses. 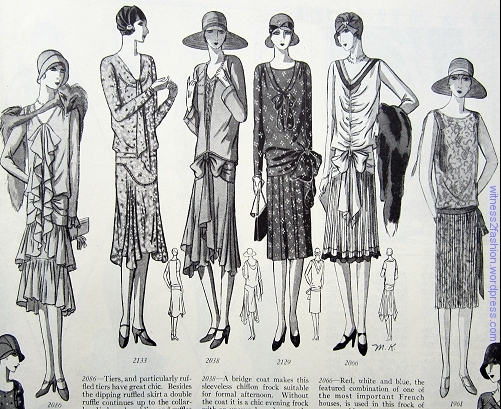 Day dresses, July 1928. Butterick patterns 2129, 2066, and 1961. Delineator. The dress on the right, #1961, is shown sleeveless, but: “The sleeveless printed frock may be worn for afternoon out of town; … for town add long sleeves.” It was suggested that the center dress, # 2066, be made in red, white, and blue. 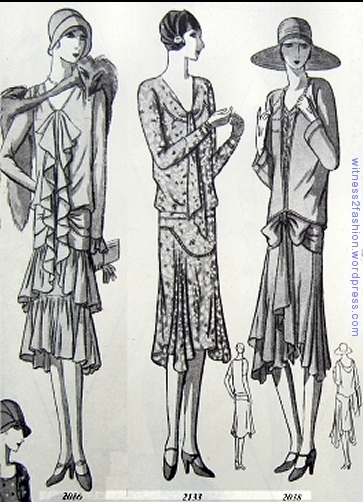 Afternoon dresses for July 1928. Butterick patterns 2086, 2133, and 2038. Delineator. Six hems, July 1928. Delineator. It’s interesting that the dresses with uneven hems (on the left) are shorter at their shortest point than the dresses with straight hems — as if the high and low hems average out to the “standard” length. 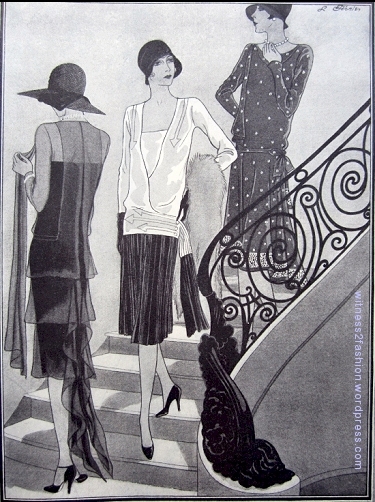 Three dresses from Frances Clyne, illustrated in Delineator, July 1928. “At teatime in town the woman at left is serenely cool in her diaphanous black chiffon frock and shadowy hat. The frock has a tiered skirt that trails to the ankles in back and a long, vague scarf.” [It’s a hem born to be stepped on, I’m afraid.] “The definite contrast of surface and color is used with skill in [the middle] frock. The blouse is lustrous white satin, the skirt, dull back crepe. . . . Arrows are traced on the blouse with fine lines of cording.” Far right: “The smooth, cool surface of black foulard is printed with small white figures, widely spaced, for this town dress of great chic. The bordered hemline is full and very long at the left side — a new note, for it is only this season that the uneven hem has been seen in the afternoon.” Frances Clyne operated an exclusive New York dress shop; in the 1930s, it was on Fifth Avenue. The Delineator illustrated many day and evening frocks in this issue — so many to each page that I have broken the diamond-shaped illustrations into manageable groups. A short, straight hem (No. 2137) and a high-in-front, long-in-back hem (actually, a flounce) [ed. 7/5/15](No. 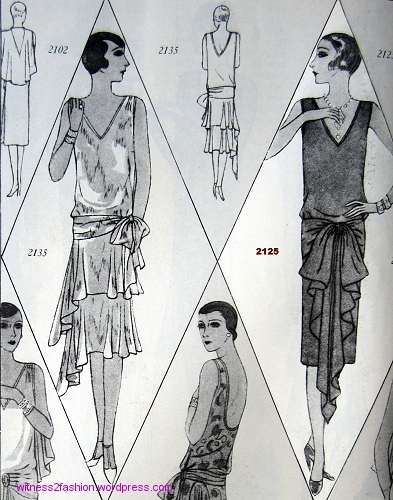 2121) from Butterick, July 1928. Summer frocks: No. 2137 (left) was for Misses 15 to 18 years (32 to 35 bust) and for ladies’ bust sizes 36 to 44. The high/low hemmed dress on the right (No. 2121) was designed for sizes 32 to 48 — the style is no longer reserved for younger women. These dresses have long side drapes — much longer than their knee-length hems. 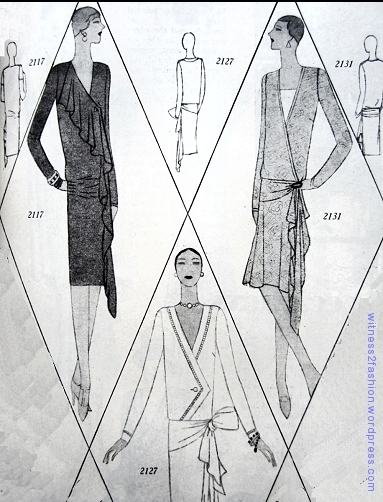 Butterick patterns 2117, 2127, and 2131; July 1928. Butterick patterns for evening frocks, # 2135 and 2125. July 1928. No. 2135 is made of moire fabric, but is “also chic in Georgette or lace.” Designed for Misses 15 to 18 years and ladies with busts 36 to 44″. No. 2125 (right): “This type of evening frock is smartest in satin crepe or lace.” Also for Misses 15 to 18 years and ladies with busts 36 to 44″. 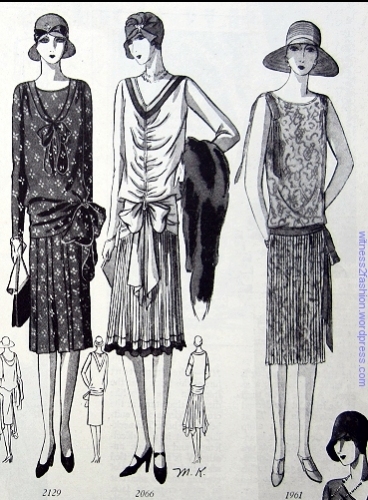 Butterick evening dress patterns for July 1928. Left, No. 1962; right, No. 2109. No. 1962, above left, shows that the handkerchief hem is still chic, but shorter and more fluttery than it was a few years earlier; No. 2109, above right, has a long hem on its right side and a trailing drapery on the left. Notice the large scale print on this sheer fabric. 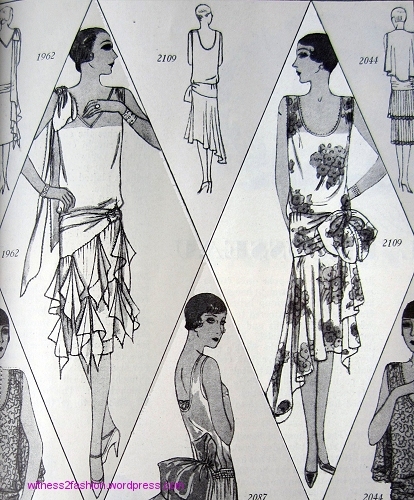 Butterick patterns for evening dresses, July 1928. No. 2112 and No. 2123. Here, (No. 2112, on the left) the scalloped, high-in front hem of 1926 seems to have shifted to the side of the body. It is balanced by a long sash on the opposite side. No. 2112 also has “the shoe-string strap . . . featured by one of the most important French houses.” Above right, “The classic evening gown of lace is included in every complete wardrobe — it is so chic and so practical.” No. 2112 was for younger women — 15 to 20 years plus ladies’ sizes 38 and 40 — but No. 2123, on the right, was available in pattern sizes up to 44 inches. Evening gowns with short-in-front-long-in back hems. 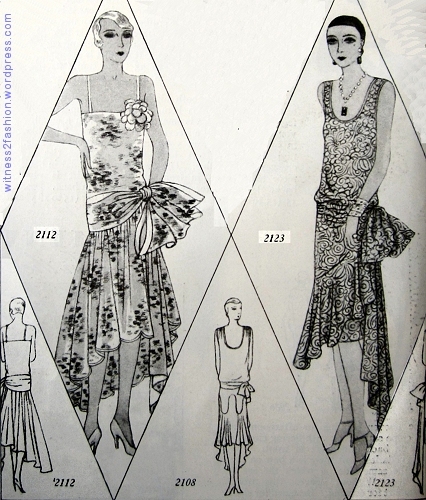 Butterick patterns 2087 and 2108, July 1928. The dress on the left, No. 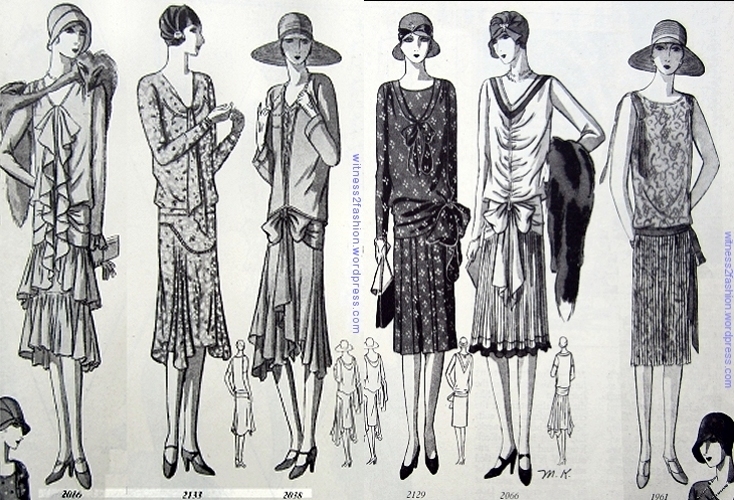 2087, is a grown-up version of the high/low scalloped frock worn by young women in 1926. No. 2108 (above right): “the most successful evening frock of midsummer is the printed chiffon with the uneven hemline. . . . With long sleeves, it is chic for afternoon. . . . Designed for sizes 32 to 35 (ages 15 to 18 years) and sizes 32 to 42.” At the sides, the top layer is very short. 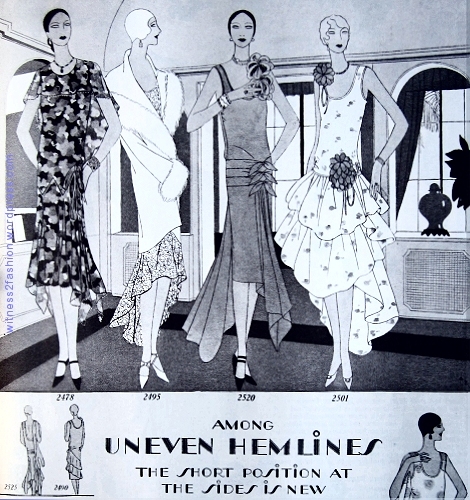 “Among uneven hemlines the short position at the sides is new.” Delineator magazine, March 1929. The 3/4 length coat, like the one above, or a knee-length coat worn over long gowns is typical. Since dresses’ hemlines were so varied, apparently fashion decreed that an evening hem draggling out below your coat was perfectly acceptable. 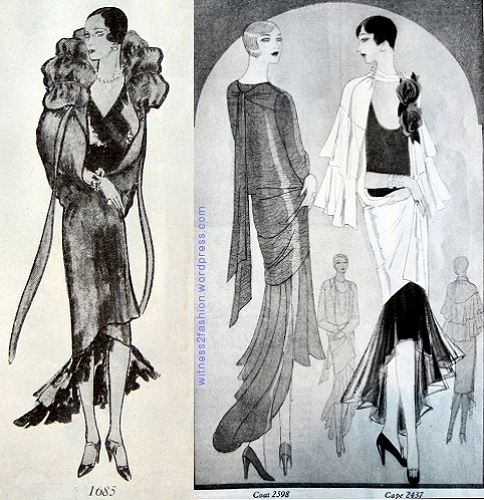 Evening coats and dresses, The Delineator, 1929. Blogger Brooke (of Custom Style) commented that these short-in-front, long-in-back dresses remind her of mullet haircuts. More 1920’s mullets ahead . . . . Very interesting! I was amazed to read that one dress was intended for a 52″ bust. That’s the largest I’ve even seen in an old pattern. Can you guess what made the designers think some patterns were fit for young women, some for older, and some for both? I think the largest Butterick pattern I’ve seen mentioned in the Delineators for the 1920’s was a size 56 bust. The normal run of sizes was from 33 or 34 to 44, equivalent to a modern size 22. Surplice styles were frequently suggested for large women. In some cases, I think the amount of tissue required for a specific pattern controlled the size range. For example, nearly identical styles sometimes appear as two different patterns, one for MIsses and one for adult women, priced differently. Sometimes a blouse and skirt are packaged and sold separately for adult sizes, but sold together in one envelope for Girls. Given how unflattering the 1920’s waistline can be to wide hips, the fact that they were sold to women with 47 1/2 inch hips (Bust 44) was quite a surprise to me. I’ve showed some of these patterns under the “large sizes” category.